Welcome to the magical mystery tour that is Venus in Scorpio and Mars in Cancer in a relationship. This couple exudes passion and emotion, diving into intensity head first. Their joint need for privacy and deep connection means that they keep many of the details of their relationship under wraps, so it may be hard for outside observers to know exactly what is really going on. Venus in Scorpio’s watery magnetism means she has no problem attracting willing partners. 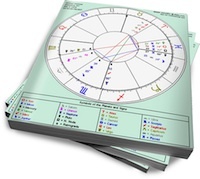 She has a deep desire to know her mate inside and out, since this Venus can never fully trust someone unless she’s sure she knows exactly what makes them tick. However, once this trust milestone is achieved, she will still need a challenge and so will seek out intense interactions with her lover to continue to test their mettle. Love may not be easy with Venus in Scorpio, but it is powerful, transformative and deep. Mars in Cancer is turned on by a strong emotional connection to the object of his desire. He is particularly intrigued by anyone who reminds him of someone from his past, as nostalgia runs deep with this sentimental sign. Though gentle and nurturing, Mars in Cancer does have claws, though these usually only come out when he feels threatened or protective of someone he loves. Nesting is his forté, and if Mars in Cancer can find a lover who loves to hide away – tucked safely in a comfy home, sharing delicious home-cooked meals – then he will be more than fulfilled. Venus in Scorpio flows easily with Mars in Cancer’s need for emotional closeness and connection. She also appreciates his inclination towards privacy and time spent processing emotions. Her desire for challenge in relationships is well-met by Mars in Cancer’s ability to continually go deep in the realm of feelings. Mars in Cancer loves Venus in Scorpio’s watery mystique, which feeds his imagination. Her need for trust and emotional complexity in relationship is easily fed by Mars in Cancer, who seems to never get enough time to process relationship issues. Both planets are in detriment, but I believe Venus in Scorpio may need to let Mars blow off some steam, get some air and let him be in his own space without seeking to penetrate deeper into his shell. In short, Venus in Scorpio has to be careful of a consistent “home” invasion. So, though, they’re both water, they’re different kinds of water by virtue of their dignities. Mars is the strong swimmer who likes to go deep, sometimes long and sometimes on shore. But Venus in Scorpio may want to stay deep too often, too long. What are you people going to talk about when the hubble telescope find another planet?